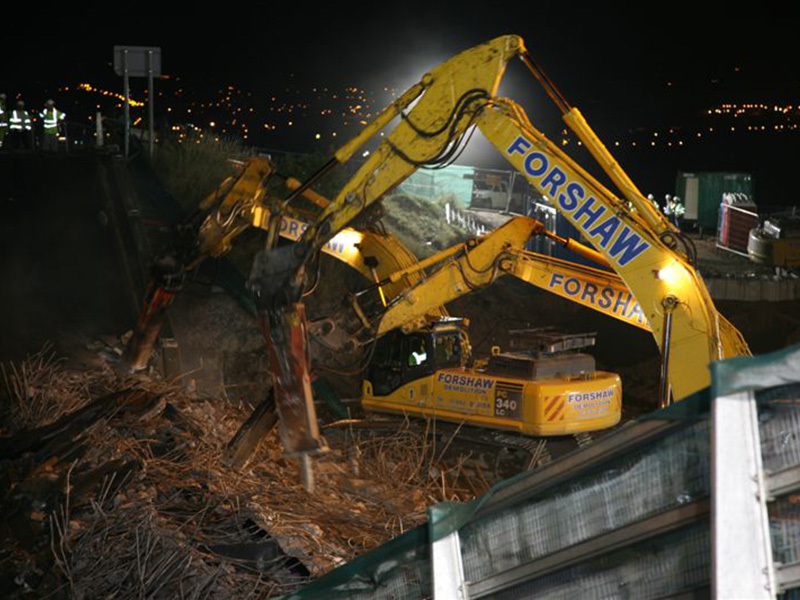 Scope: The contract involved the demolition of a two-lane accommodation bridge over the M62 in Lancashire. 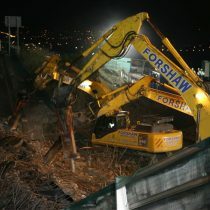 The redevelopment of junction 21 of the M62 in Milnrow near Rochdale by Costain Ltd incorporated the removal of the existing Dig Gate Lane Bridge over the motorway due to the northerly pier being situated in the position of the proposed exit slip road. 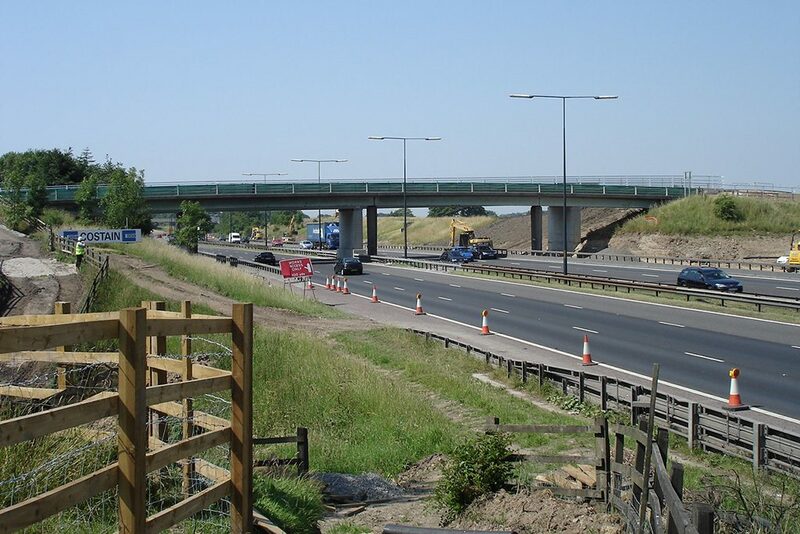 The bridge was utilised as a rural all-purpose single carriageway bridge providing accessing to a local farm and footpaths over the M62 between junctions 20 & 21. 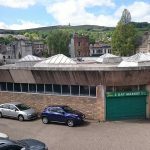 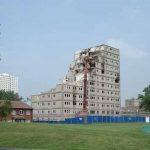 We were appointed in March to carry out the demolition in July. 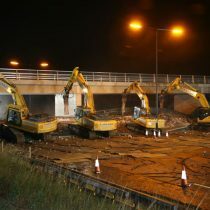 There were several methods suggested and discussed to demolish the bridge. 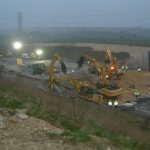 Initially, our client and the Highways Agency asked us to dismantle the bridge in a piecemeal fashion during carriageway lane closures, but without a full motorway closure. 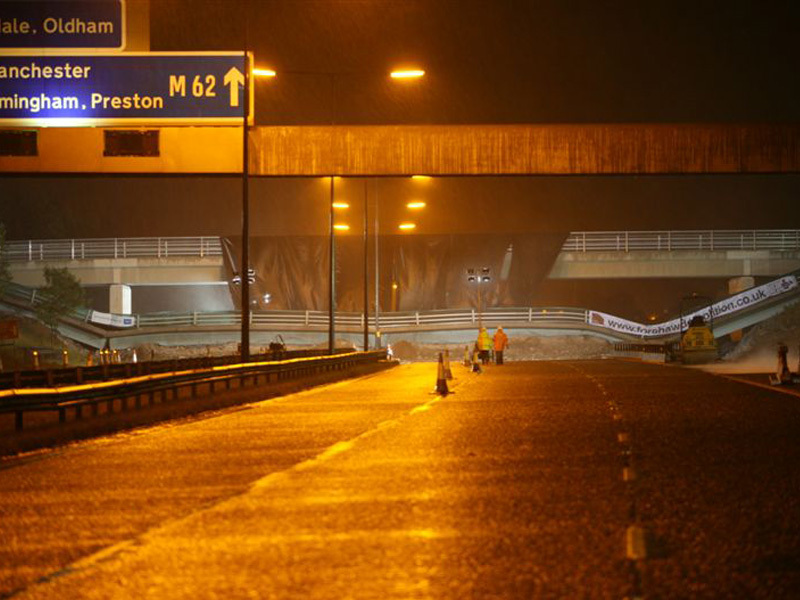 They also stipulated that the lifting of the dismantled bridge sections could only be done during weekend nights when the motorway could be reduced from 3 lanes to 2 in both directions, resulting in several visits over many months and significant temporary works. 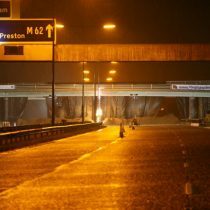 After careful consideration, our preferred option was to arrange an overnight closure of all lanes of the motorway, demolish the bridge using controlled explosives and then process the bridge on the deck. 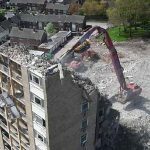 Our viewpoint was that the whole process could be done in 12 hours, rather than several months and, the inconvenience of having the motorway closed for one night would be outweighed by the much reduced timescales for demolition. 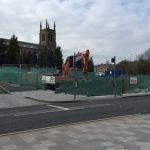 Our design team arranged a presentation with Costain and the Highways Agency and, after considerable deliberation, it was agreed that this method could be implemented. 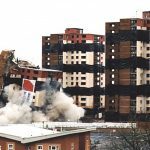 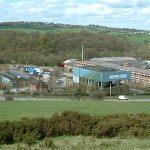 Careful planning was called for to ensure that all the necessary arrangements were made for the demolition and motorway closure. 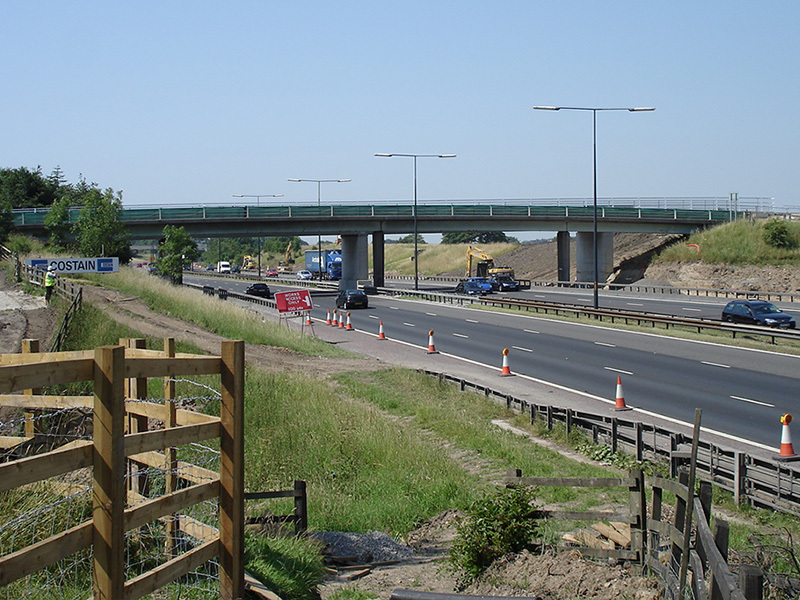 We had several meetings with the Highways Agency to arrange such items as letter drops to local residents, traffic diversion routes, leaflets in service stations, radio adverts, website information, motorway matrix warning signs, etc. 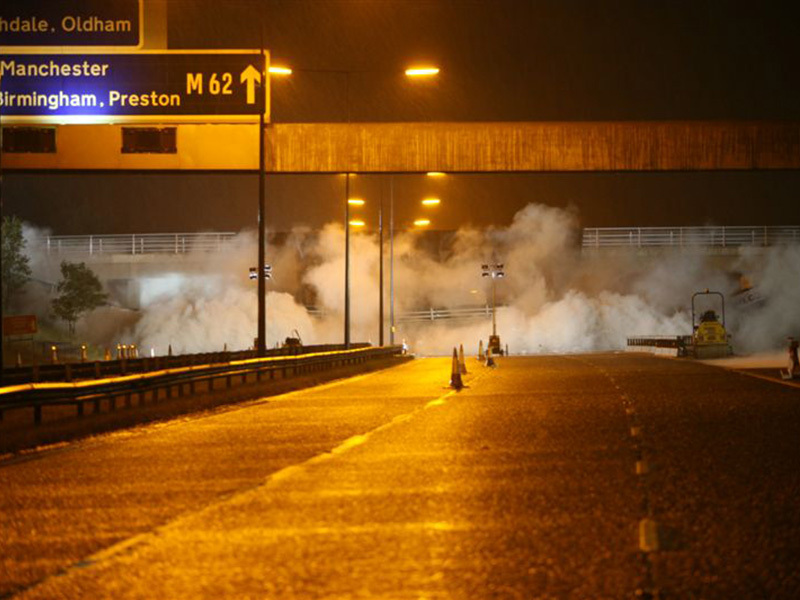 to ensure that the maximum amount of people would be aware of the closure of this busy stretch of motorway. 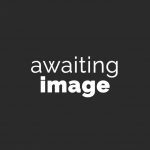 A further practical complication was that the new alternative bridge had been constructed less that 3m to the west of the old bridge, and the client was obviously keen to avoid any damage to this new structure. 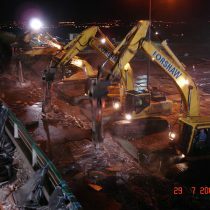 To monitor our effect on the new bridge, our seismograph was set up on the new bridge deck to record any vibration that might result from the demolition process. 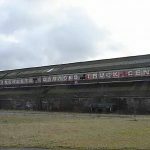 Although there were no properties within the demolition exclusion zone, there was a farm with significant livestock. 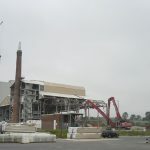 Arrangements had to be made with the farmer to transport the animals, in advance, to an alternative farm where they would not be disturbed by the explosion. 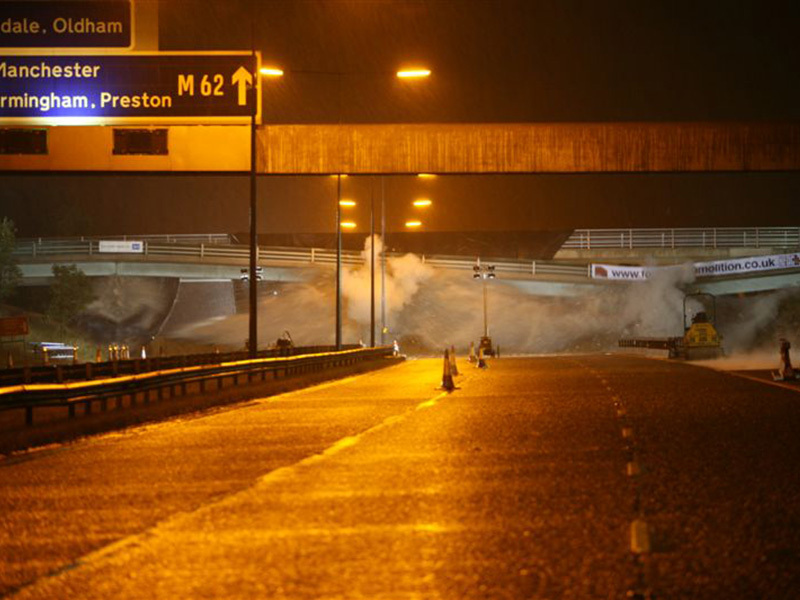 During the early part of blowdown day, the bridge was prepared for demolition by inserting the explosive charges in to pre-drilled holes in the bridge piers and applying protective mesh around these areas to contain and focus the blast energy. 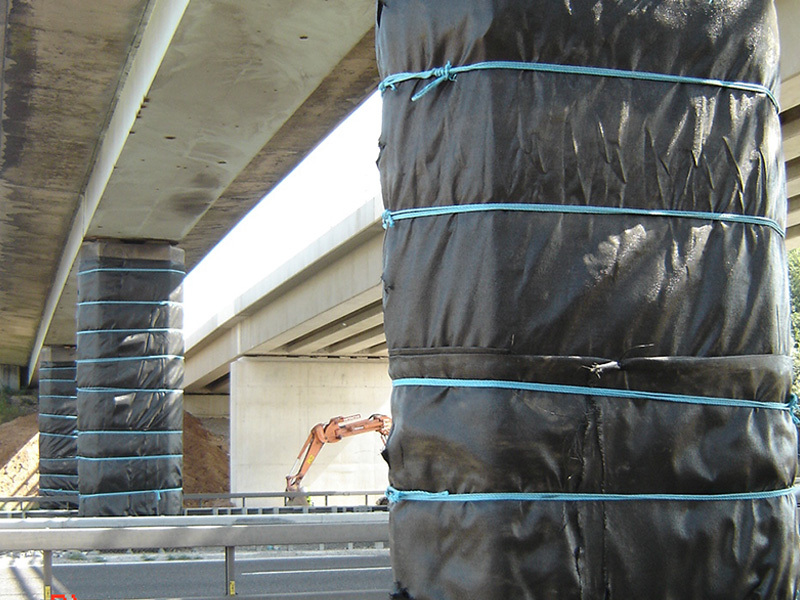 Matting was also placed around the adjacent new bridge piers to provide protection. 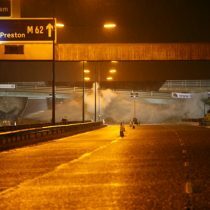 The motorway was closed at 20:00 on Saturday 29th July and our team moved in to action immediately. 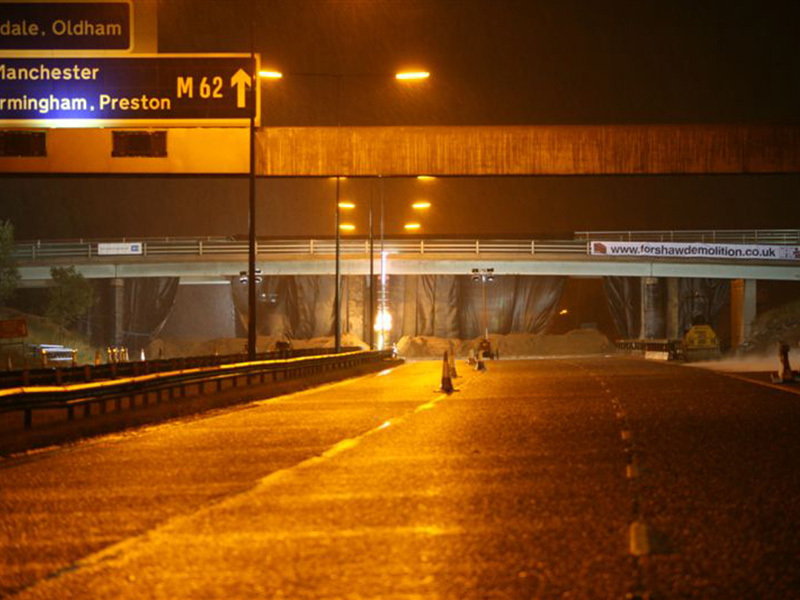 The central reservation and hard shoulder barriers were removed and a combination of geotextile, plywood sheets and sand were placed directly beneath the bridge to provide protection to the motorway surface. 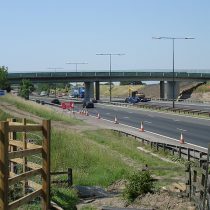 Live cables servicing the motorway CCTV cameras were protected with additional steel sheets. 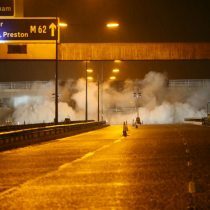 The bridge was detonated at 22:30 and the all clear given by our explosives’ engineer. 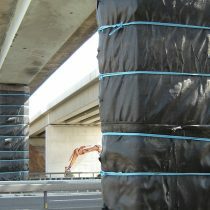 The new bridge structure was given a clean bill of health after an inspection by Costain’s engineers. 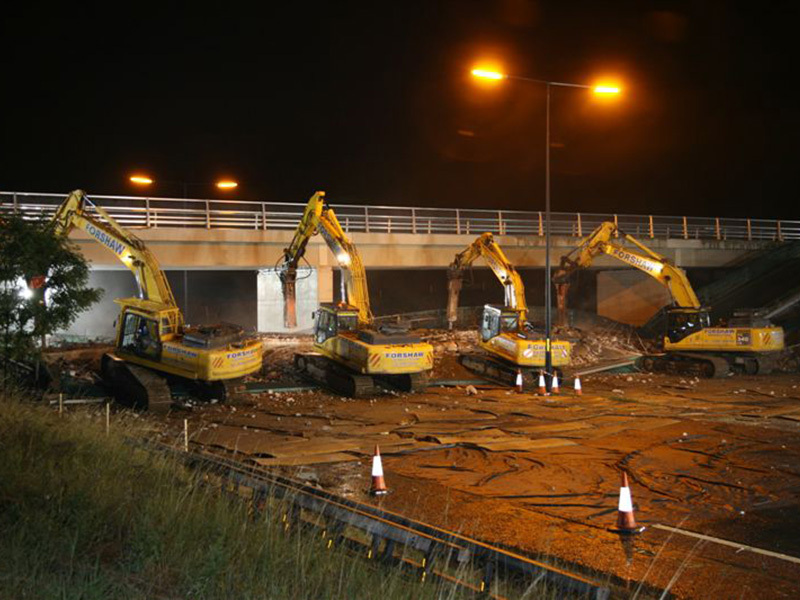 Four of our demolition excavators fitted with breakers then proceeded to fragment the bridge structure still further. 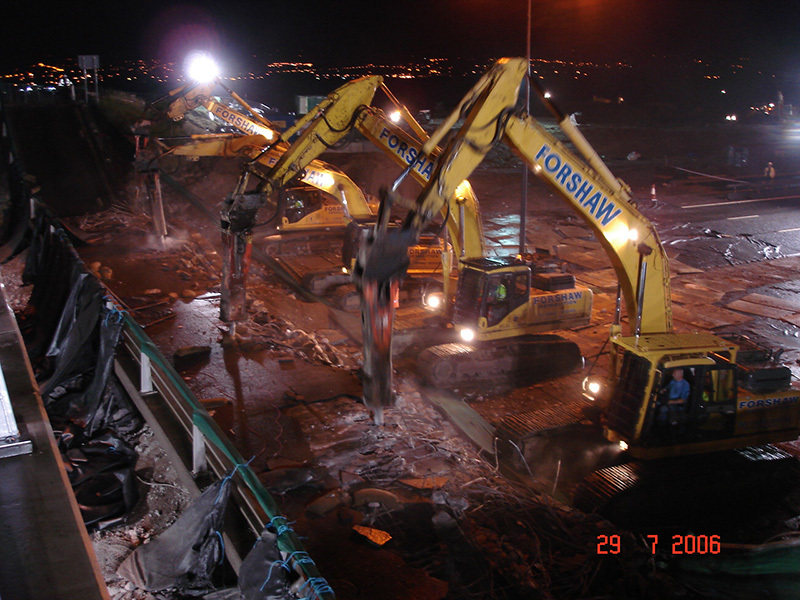 The bridge material was cleared away to an adjacent lay down area for later processing. 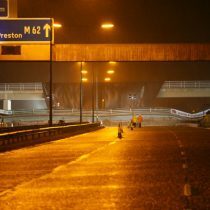 Once all the protection had been removed, the motorway was swept clean and handed back more than 1 hour ahead of schedule at 08:00 on Sunday morning.